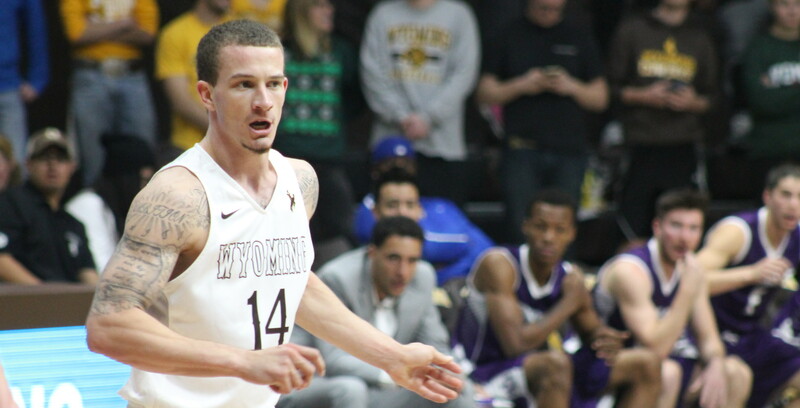 Wyoming’s Josh Adams has earned Associated Press All-America Honorable Mention, the organization announced Tuesday. The senior guard is the 17th Cowboy to be named an All-American and first since Josh Davis in 2002. He was also one of just two players from the Mountain West on this year’s list, as Fresno State’s Marvelle Harris was also an Honorable Mention. A native of Parker, Colo., Adams averaged 24.7 points per game in 2015-16 for first in the Mountain West and third in the NCAA. He also paced the Pokes at 5.5 rebounds per contest, 4.2 assists and 1.5 steals, while ranking in the top 10 of 11 different MW statistical categories. His 3.2 threes per game also led the conference and ranked 15th in the nation. Adams scored 740 points this season to break Wyoming’s single-season record of 701 by Flynn Robinson in 1964-65, while his nine threes against Colorado State on Feb. 20 tied UW’s single-game record. Adams was also named All-MW First Team by the league’s coaches, tabbed MW Player of the Year by the conference’s media and claimed All-District honors from the U.S. Basketball Writers Association and the National Association of Basketball Coaches. Adams recently signed with BDA Sports Management and is currently in Santa Barbara, Calif., preparing for the NBA draft in late June. Josh Adams, Wyoming; Ryan Anderson, Arizona; Anthony “Cat” Barber, N.C. State; DeAndre’ Bembry, Saint Joseph’s; Ben Bentil, Providence; Trevon Bluiett, Xavier; Joel Bolomboy, Weber State; Evan Bradds, Belmont; Dillon Brooks, Oregon; Cane Broome, Sacred Heart; John Brown, High Point; Antonio Campbell, Ohio; Kyle Collinsworth, BYU; Stephen Croone, Furman; James Daniel III, Howard; Juan’ya Green, Hofstra; Derrick Griffin, Texas Southern; Alex Hamilton, Louisiana Tech; A.J. Hammons, Purdue; Marvelle Harris, Fresno State; Josh Hart, Villanova; Danuel House, Texas A&M; Brandon Ingram, Duke; Stefan Jankovic, Hawaii; Tim Kempton, Lehigh; Max Landis, IPFW; Shawn Long, Louisiana-Lafayette; Dallas Moore, North Florida; Nic Moore, SMU; Gary Payton II, Oregon State; Alec Peters, Valparaiso; Justin Robinson, Monmouth (N.J.); Domantas Sabonis, Gonzaga; Justin Sears, Yale; Pascal Siakam, New Mexico State; Melo Trimble, Maryland; Fred VanVleet, Wichita State; Thomas Walkup, Stephen F. Austin; Jameel Warney, Stony Brook; Isaiah Whitehead, Seton Hall; Kyle Wiltjer, Gonzaga.